Good grief. I think I've actually worked more hours this week than did when I was working full time. Oddly enough, I've been enjoying this, even though it has required a lot of scrambling around. My apologies for leaving the 'full time jitters' rant up as long as i did. I've just been a little TOO busy to get to a new one. As i said last week, it's been my plan to someday go full time with this manga stuff since... well, i've always wanted to. I mean, who doesn't dream about doing stuff they love to do professionally? I've been drawing, doodling, and writing stories most of my life. When i got my first computer, an IBM PC (it had two floppy disk drives, no hard drive, and an RBG screen. WOO! ), I logged far more hours in WordStar and WordPerfect writing stories than I spent playing games. When I was in high school, I really wanted to go to either Sheridan College or UCLA and study Animation. I was a huge Disney fan, and I loved animation - but studying to be an animator was an absurd notion back then. This sorta gives away how old i am (33) but when I was planning my college career, the animation industry was dead. 'The Little Mermaid' didn't come out until my Senior year of college. We all know how much things exploded after that. I had a chance to get in on the ground floor if I had followed my 'dreams'... but instead, I followed other paths, and eventually graduated with a degree in Architecture. Funny huh? Honestly, I have no regrets about missing that boat. My creative nature would be totally different than it is today. Instead of being directed and nurtured to service the existing Animation industry, I've had the freedom to let it develop the ways I've wanted it to. Maybe I wouldn't have succeeded back then. I wouldn't have designed and built the buildings that I have. I would have never met Seraphim. I would never have done Megatokyo. I'd probably have different cats than I do now. Anyways, i'm getting off track. Sure, I've always wanted to do something like this professionally, but it's not something you can just throw yourself at and hope you make it. You have to be smart about it, honest with yourself, and realize that pursuing such things not only has risks, but its far harder than following well paved and trodden tracks. The only time I had to pursue this stuff was in my spare time outside of work. Once Megatokyo started to really take off, I was suddenly seeing that maybe there was a real path opening up here - something i could follow, if i nurtured it right. Most of the time, the path do being a professional manga-ka was like plowing thru the underbrush in a forest that had no clear path thru it. Megatokyo started to form the beginnings of a trail. I've widened it, tried to make it more passable, but these were just forays into the brush on either side of the well paved highway that was my architecture career. Now, i've completely left that highway behind me, and the path before me is a lot like a dirt road. Now, If i can upgrade this to a gravel road, i think i'll be ok.
Ok, i think i was getting a little too metaphoric there, but you get the idea. :P What i've been doing for the past week has been trying to lay a little gravel, something to keep the mud from swallowing me up. I've been working hard in the background to try to set things up so that one day I could go full time. Quite a while ago I actually set up a 'company' that I work thru for all of this - Fredart Studios LLC (one employee, and that's me :P) Neat, huh? So, even though I am not really ready, I've been trying to set things up so that one day I could take the plunge and do this full time. It's just about eight months ahead of schedule. The very first thing on my agenda was to get back into doing the comic regularly. Each comic takes six to eight hours, so it's not a small amount of time, but it's definitely the #1 priority. I've managed that goal. I have a lot of other things to do for the websites, including getting the character and story sections updated, being more regular with rants, uploading more artwork to my fredart site (this I have actually started doing - from here on out, I intend to upload at least one sketch every week.) - it will take some time to get all of this moving along, but it will happen.. The second thing on my agenda was to get new merchandise ready for the ThinkGeek store. Designing this stuff takes time, but I think i have a pretty good selection of new shirts and other items in the works. Of interest is Junpei's NINJ4 hoodie, some girl's stuff (Kimiko's 'angel' shirt, and version 2.0 of the I.A.C. shirt), a new version of the 'overclocked' t-shirt, Erika's QuickKill shirt, a big Megatokyo coffee mug, and some other swag including a megatokyo hat, polo shirt and maybe even a bookbag. There's also this nifty little thing that should be in the store pretty soon. What is it? It keeps you warm, it's soft and fuzzy, and it's laying over a pool table. I have one, actually, and the cats won't let me near it. It's also kinda scary, because Kimiko is like 14 feet tall on it. If nothing else, it will answer all the questions about where this rant image came from. Believe it or not, all that was an awful lot of work. What else have I been doing? I've been teasing people with another project I started years ago called 'warmth' ever since Megatokyo started. 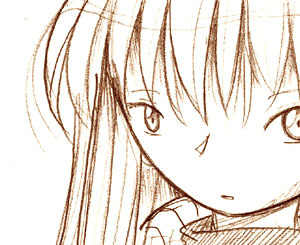 In fact, I never planned to do Megatokyo, it just sorta came in and took over my life before I knew what happened. 'Warmth' was the comic/story/project I was working on at the time. Honestly, I didn't have the drawing skillz at the time to do the project - and that's part of why i decided to do Megatokyo - i needed practice, and Megatokyo was a better medium to practice with. Well, here I am, over two years later, looking at doing this manga stuff full time. Megatokyo, of course, will do nothing but improve - i think that just having 3 comics regularly per week will be a vast improvement for most readers. I also wanted to look at how i could revive the 'warmth' project and get that going. I.C. entertainment (formerly IronCat) (the people publishing the Megatokyo book) approached me with the idea of issuing 'warmth' as a monthly installment in their new manga collection 'AmeriManga'. - basically, a comic-sized 'graphic novel' format book printed every month containing the work of 5 american manga artists. I was pretty impressed with the artists contributing to it, and also with the format (nice decent quality printing and binding) so i decided to give it a go. Starting in February, 'warmth' will premier in I.C. Entertainment's AmeriManga collections. 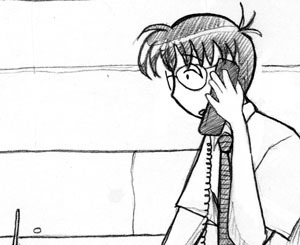 Hopefully I can pull off a real, honest to goodness 25 page per month manga title... I'm nervous about the concept, but i'm looking forward to it. While talking about it and digging thru all of my old notes and materials, I drew this sketch of Tobari Saeko, one of the main characters. If you are worried about my work on Warmth effecting Megatokyo, don't. I have time now to do all of this. More info on this in the near future. Funny. I no idea how I could do all this if i was still working. :) Sorry if this rant rambled a little, just got a lot on my mind. I voted today. I'm not going to say who I voted for, or who you should've voted for--that's your own choice. But I was talking to our own Asmodeus today, and he told me how desperately he wishes he could vote--after all, it would mean that he had his citizenship. And my parents are exactly the same way. Every first Tuesday in November, they've diligently headed to their local voting booth and put in their vote. A few times, they brought me with them, and each time impressed upon me how important it was to be able to cast a vote at all. They've always been proud that I was born on the day that Bao Diep was overthrown and the Nguyen dynasty ended--they call it the Vietnamese 4th of July--and understandably enough, their experiences as Vietnamese refugees have made them value their vote 'til the day they die. The voting experience was funny today, though. I looked up the place online, and when I saw "Totland", I blinked a few times and checked again. Yup, I walked to the local playground-slash-day care center and voted there. It was a little surreal seeing a sign on the door saying "Parents of 3 and 4 year olds-no art class today due to elections". But at least the new touch-screen ballots they have here in the Bay Area rock. It was nice being able to look at all my choices and revise them before submitting the ballot. I hope more precincts get these things... they rock. But... dammit, I forgot to grab my "I Voted" sticker. That was the best part of going to the polls with my parents back when I was 8! I'm bitter, now.